Pigs are even-toed ungulate mammals (Order Artiodactyla) of the genus Sus, within the Suidae family. They are native to Eurasia and northern Africa. Pigs, in the wild, live mostly in forests and partly wooded areas and play an important role in nature. The domestic pig, Sus scrofa domesticus, was one of the first animals domesticated by humans and is still today one of the most important domestic animals. The treatment of pigs in today's intensive agriculture raises animal welfare concerns regarding this highly intelligent animal. Likewise, although wild pigs are an integral part of ecosystems, providing a number of ecological benefits, the development of feral populations of domestic pigs has resulted in environmental concerns, particularly in regions where pigs are not native. Pigs are one of the most widespread and successful genera of large mammals. They are found wild over most of Eurasia from tropical jungles to northern forests. There are 10 species of living pigs. The Eurasian wild boar, Sus scrofa, has the largest range of any wild ungulate and has about 25 subspecies (Watson 2002). The smallest pig, the Pygmy hog of India, Sus salvanius, is about 20 to 30 cm (8 to 12 in) high at the shoulder and weighs 7 to 12 kg (15 to 26 lbs); the Eurasian wild boar can be from 55 to 110 cm (1.8 to 3.6 ft) high at the shoulder and weigh from 44 to 320 kg (91 to 711 lb) (Huffman 2006). Unlike most other hoofed mammals, pigs do not have multi-chambered ruminating stomachs and can not survive on leaves and grasses alone. Instead they are omnivores, which means that they consume both plants and animals. They eat a wide variety of foods, including acorns and other seeds, green vegetation, roots, tubers, fungi, fruit, carrion, eggs, insects, and small animals—snakes being a favorite. Occasionally, in times of shortage, a mother pig may eat her own young. A typical pig has a large head with a long snout, which is strengthened by a special bone called the prenasal bone and by a disk of cartilage in the tip. The snout is used to dig into the soil to find food and is a very sensitive sense organ. Pigs have a full set of 44 teeth. The canine teeth, called tusks, grow continually and become very sharp as a result of the lowers and uppers rubbing against each other (Nowak 1983). Pigs have a proportionally larger brain than sheep, goats, or antelope and they also posses more of that part of the brain that governs the ability to reason. Pig brains are not unlike our own. Pigs are social animals. In the wild, female pigs and their young live in extended family groups called "sounders." (Adult males are usually solitary.) The members of a sounder communicate with each other by sight, sound, and smell and cooperate to find food and to watch for, and sometimes, fight off, predators. Pigs do not have effective sweat glands, so pigs cool themselves using water or mud during hot weather. They also use mud as a form of sunscreen to protect their skin from sunburn. Mud also provides protection against flies and parasites. Pigs have a high reproductive rate. Females reach maturity in about a year and can have a litter of piglets, mostly 4 to 8 in the wild, every year after that. 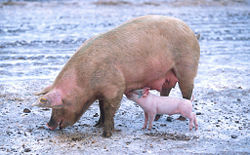 Pigs are unusual among hoofed animals in that the mother builds a nest in which to give birth and care for her young. 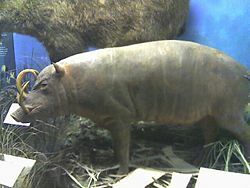 Two other members of the pig family, Suidae, which live in Africa and are very similar to species of the Sus genus are the African bush pig, Potamochoerus porcus, and the giant forest hog, Hylochoerus meiertzhageni. The wart hog, Phacochoerus aethiopicus, lives in grassland rather than forest as do other Suidae. The babirusa, Babyrousa babyrussa, lives on some of the islands near southeastern Asia and is notable for its upper tusks, which grow through the roof of its mouth and curve back, perhaps protecting its eyes from tree branches as it runs through the forest and from the lower tusks of other babirusa in fights. In North and South America, where pigs are not native, a related family, Tayassuidae, the peccaries, fill the same ecological niche and closely resemble pigs in form and behavior (Nowak 1983). The domestic pig (Sus scrofa domesticus) is usually given the scientific name Sus scrofa, though some authors call it S. domesticus, reserving S. scrofa for the wild boar. The wild boar (Sus scrofa) is the wild ancestor of the domestic pig. It was domesticated beginning about 10,000 years ago, possibly in both China and the Middle East (Clutton-Brock 1999). Domestic pigs were spread across Asia, Europe, the Middle East, northern Africa, and the islands of the Pacific in ancient times. Pigs were brought to southeastern North America from Europe by Hernando de Soto and other early Spanish explorers. Escaped pigs became feral and were freely used by Native Americans as food. 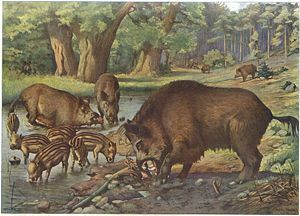 The social and adaptable nature and omnivorous diet of the wild boar allowed early humans to domesticate it much earlier than many other forms of livestock, such as cattle. Pigs were mostly used for food, but people also used their hide for shields, their bones for tools and weapons, and their bristles for brushes. The domestic pig is farmed for its meat, which is called pork. Products made of pork include sausage, bacon, and ham. The head of a pig can be used to make head cheese. Liver, chitterlings, and other offal from pigs are also widely used for food. 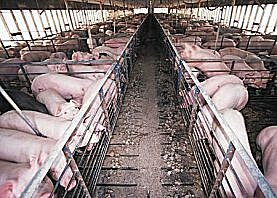 In industrialized nations, domestic pig farming has shifted away from the traditional pig farm to large-scale intensive pig farms where meat can be mass produced. This has resulted in lower production costs, but more significant animal welfare concerns. In developing nations, and some parts of developed nations, the domestic pig is frequently raised outdoors in yards. In some cases, pigs are even raised in open fields where they are allowed to forage; they are sometimes watched by swineherds, essentially shepherds for pigs. In 2005, the global stock of pigs (about 1 billion total) showed China with 488.8 million head of domestic pigs, followed by the United States with 60.4 million head, Brazil with 33.2 million head, Vietnam with 27 million head, Germany with 26.9 million head, and Spain with 25.3 million head. Pigs have been used to find truffles, to herd sheep, to flush out game for hunters, and as performers in circuses and movies. Because of their anatomical similarity to humans in many respects they have been used in medical experiments. Pig heart valves are transplanted into human hearts and pig livers have saved human lives by being linked to failed livers of human patients in a process called "porcine perfusion" (Watson 2004). Pigs are known to be intelligent animals and have been found to be more trainable than dogs or cats. Asian pot-bellied pigs, a smaller breed of the domestic pig, have made popular house pets in the United States beginning in the latter half of the twentieth century. Regular domestic farmyard pigs have also been known to be kept indoors, but due to their large size and destructive tendencies, they typically need to be moved into an outdoor pen as they grow older. 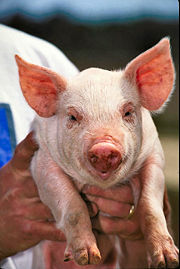 Most pigs also have an extreme fear of being picked up, but will usually calm down once placed back on the floor. There are many breeds of pigs, with various characteristics, which make them suitable for different environments and different desired products. In 1997, the three most popular breeds in the United States were the Duroc, the Hampshire, and the Yorkshire (Klober 1997). Pigs are exhibited at agricultural shows, judged either as stud stock as compared to the standard features of each breed, or in commercial classes where the animals are judged primarily on their suitability for slaughter to provide premium meat. Pigs intersect with religion and culture in a number of ways. The dietary laws of Judaism and Islam forbid the eating of flesh of swine or pork in any form, considering the pig to be an unclean animal. 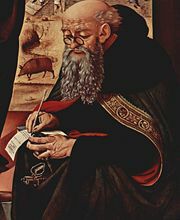 In Christianity, pigs are associated with Saint Anthony, the patron saint of swineherds. In Hinduism, the god Visnu took the form of a boar in order to save the earth from a demon that had dragged it to the bottom of the sea. In ancient Egypt, pigs were associated with Set, the rival to the sun god Horus. When Set fell into disfavor with the Egyptians, swineherds were forbidden to enter temples. In ancient Greece, a sow was an appropriate sacrifice to Demeter and had been her favorite animal since she had been the Great Goddess of archaic times. Initiates at the Eleusinian Mysteries began by sacrificing a pig. The pig is one of the 12-year cycle of animals that appear in the Chinese zodiac related to the Chinese calendar. Believers in Chinese astrology associate each animal with certain personality traits. 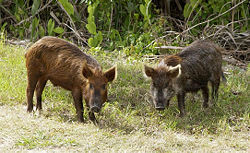 Feral pigs, like other introduced mammals, are major drivers of extinction and ecosystem change. They have been introduced into many parts of the world, and will damage crops and home gardens as well as potentially spreading disease. They uproot large areas of land, eliminating native vegetation and spreading weeds. This results in habitat alteration, a change in plant succession and composition, and a decrease in native fauna dependent on the original habitat. Huffman, B. 2006. The Ultimate Ungulate Page. The Ultimate Ungulate Website. Retrieved April 10, 2007. Invasive Species Specialist Group (ISSG). 2006. "Global Invasive Species Database: Sus scrofa." Retrieved April 10, 2007. Moore, J. R. 2001. Swine Production: A Global Perspective. Retrieved April 10, 2007. Oklahoma State University (OSU). 2006. Breeds of Livestock: Swine. Retrieved April 10, 2007. University of California Museum of Paleontology (UCMP). 2006. Ungulates: Hoofed Mammals. Retrieved April 10, 2007. This page was last modified on 4 April 2008, at 00:06.